Small volumes of anti-KIT antibody vial(s) may occasionally become entrapped in the seal of the product vial during shipment and storage. If necessary, briefly centrifuge the vial on a tabletop centrifuge to dislodge any liquid in the container`s cap. Certain products may require to ship with dry ice and additional dry ice fee may apply. 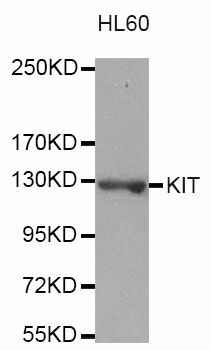 Western blot analysis of extracts of HL-60 cells, using KIT antibody. NCBI/Uniprot data below describe general gene information for KIT. It may not necessarily be applicable to this product. Kit: a receptor tyrosine kinase and a member of the subfamily that includes PDGF, CSF-1 and FLT-3/flk-2 receptors. Receptor for stem cell factor. Plays a critical role in hematopoietic stem cell, mast cell, melanocyte and germ cell development. Ligand binding induces autophosphorylation, dimerization and activation, leading to the recruitment and phosphorylation of downstream SH2-containing signaling components including PLC-gamma, PI3 kinase p85, SHP2 and CrkL, linking c-Kit to various cell signaling pathways. Molecular lesions that impair the kinase activity of c-Kit are associated with a variety of developmental disorders, while mutations that constitutively activate c-Kit can lead to hyperplasia and tumorigenesis. Activating mutations cause >90% of gastrointestinal stromal tumors (GIST); successfully treated with inhibitors Gleevec (imatinib, Glivec) and Sutent (Sutinib, SU11248). Activating mutations also induce mastocytosis. Autocrine/paracrine stimulation may drive some lung and other tumors. Loss of expression associated with melanoma progression. Familial loss of function mutations cause piebaldism, with defects in hair and skin pigmentation due to lack of melanocytes. 1. CD117 was positive in all cases of adenoid cystic carcinoma, with 93% showing moderate or strong staining. basal cell carcinoma were less frequently positive, with only 20% of cases showing labelling of weak or moderate intensity.